Editor’s Note: The Siege of Petersburg Volume 2: The Western Front Battles, September 1864-April 1865 by Ed Bearss and Bryce Suderow is scheduled to be released in early 2014, according to publisher Savas Beatie. The publisher was kind enough to pass along this unedited, original version of a portion of the chapter on the March 25, 1865 Battle of Fort Stedman, the last major offensive operation of the Army of Northern Virginia. This chapter was written by Bill Wyrick, who filled in and covered one of the few portions of the Siege for which Ed Bearss did not write a monograph. 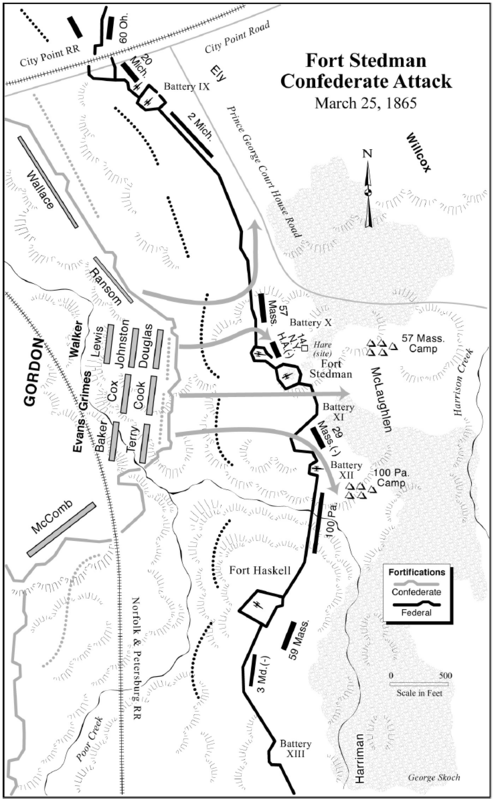 The excerpt covers the initial Confederate assault on Union held Fort Stedman by Gordon’s Second Corps, ANV. The attempt was made in an effort to threaten the Union supply depot at City Point, perhaps causing Grant to withdraw from the stranglehold he then held on Petersburg and Richmond to protect his base and allow an escape by Lee’s men. By March of 1865, Lee’s Army of Northern Virginia was outnumbered more than two to one outside Richmond and Petersburg, with his entire command tied to tens of miles of trenches and forts. Desertions were increasing, morale was falling, disease coursed through his troops, and supplies were dwindling. Union armies elsewhere were reducing what was left of the Confederacy, collapsing Southern-controlled terrain inexorably toward Virginia. With nothing of substance left to do in the Shenandoah Valley, it was likely Phil Sheridan’s 50,000 men would move east. The initiative remained firmly in the hands of Lee’s opponents. Once the rainy season passed, he knew Generals Grant and Meade would resume active operations. The odds of stopping them increased with each passing day. On the night of March 4, 1865, Maj. Gen. William Mahone’s Rebel infantry division left its position on the far left of Lee’s line, which it had occupied since June of 1864, and replaced Maj. Gen. George Pickett’s Division on Bermuda Hundred. Pickett moved his men north and joined the rest of James Longstreet’s I Corps above the James River. After much discussion, Lee told informed Maj. Gen. John Gordon that “there seemed to be but one thing that we could do—fight. To stand still was death. It could only be death if we fought and failed.” After more than two weeks of planning, Gordon suggested that Lee strike the Union right at Fort Stedman. The lines were close there, and important Union supply bases were behind Stedman, including City Point. A breakthrough might capture these areas. In addition to disrupting Union operations and logistics, a successful attack would help protect the Southside Railroad from further Union attacks by forcing Grant to weaken his own left to confront the victorious Confederates. Editor’s Note: The portions of the chapter describing the situation as it stood in late March 1865 and planning for the attack have been removed in the interests of space. When the last of the barricades was pulled aside, Gordon wrote that he ordered the private to fire the shot that would set the attacking force in motion. The soldier balked at crossing his fellow sentry in blue. Gordon said that when he repeated the order in a threatening manner, the private called out, “Hello, Yank! Wake up; we are going to shell the woods. Look out; we are coming.” Having repaid his enemy’s favor, the young man fired his gun, sounding the call to battle. Union General Willcox, commanding the First Division of the IX Corps, reported that the Rebels struck in three columns: one swept across the low ground toward FortStedman and Battery No. 10 in its front, one moved directly on FortStedman, and the third advanced toward a point between FortStedman and Battery No. 11 to the south. Battery No. 10 was but a small enclosure that connected with the front of FortStedman, and the Southern storming party quickly swept over it. Because no alarm had been given, Lieutenant Ephraim B. Nye of the 14th Massachusetts Light Artillery was killed before his men could fire more than a single round from two three-inch rifles. Captain John M. Twiss of the 1st Connecticut Heavy Artillery, in charge of three coehorn and four eight-inch mortars, was wounded. Those few Federals who were not killed, wounded, or captured fled toward the Reserve Camp at Meade’s Station more than a mile to the rear. His flag could not be seen the length of a company, however much he might wave it, so he kept his voice going loud enough to be heard all along the line of the regiment saying: Here’s your flag; come on men, keep in line. . . . The men could not be urged to a double-quick, and it seemed a long time getting across that open field. The enemy, however, had been struck with such consternation at the boldness of the well-nigh exhausted gray lines that they fled in dismay after a feeble effort at resistance and left the attacking force in complete possession of FortStedman. The two regiments entered the Federal line, and no enemy appeared near. Amid the confusion, the commanding officer of the Federal Third Brigade, General McLaughlen, appeared in Fort Stedman and began issuing orders to the men around him. Private I. G. Bradwell of the 31st Georgia related how McLaughlen “happened to face with Lieutenant Guinn, who was advancing, pistol in hand, with the foremost men. He asked: ‘Are you a Rebel?’ To this Guinn replied, ‘I am,’ and commanded him to surrender. When asked if he was an officer, Guinn replied that it did not matter and told the general to surrender immediately or he would blow his head off.” McLaughlen complied, but was allowed to keep his sword until General Gordon arrived to assume command of the fort for the Confederacy. Private Bradwell escorted McLaughlen to the rear for safekeeping, leaving him “mad enough to die for his bad luck.” Ironically, only the day before McLaughlen had explained to visitors his own proposal for a Union attack against Confederate lines from the left of FortStedman. Captain Carson recalled that another Union officer—evidence suggests it was Captain Henry Swords of Willcox’s staff, division officer of the day—rode into the line forming behind FortStedman. “He was magnificently mounted and reined up almost against me,” Carson recalled, “with the words, ‘Hello, boys, how are things going?’” Carson replied, “They are going pretty well,” before inviting him to dismount. When two of Carson’s men leveled their rifles at him, the Union officer dismounted and gave up his horse, “with the injunction to take good care of him.” After waiting “some little time” for the arrival of General Gordon, Carson deployed his sharpshooters as skirmishers behind FortStedman. The Doles-Cook Brigade would soon come up behind them as the sharpshooters moved toward the second line of forts farther to the east. Meanwhile, Colonel Stribling had led two detachments from the Fauquier Artillery and two men each from other batteries of his artillery battalion into FortStedman. Stribling’s detachment turned at least two of the captured cannon and began firing the guns into Federal troops manning the works up and down the line. The Confederates on the left—with Ransom’s and Lewis’s Carolinians in the lead—swung northward from the captured fort toward the Appomattox River. They swept the line of the 57th Massachusetts from the flank and the rear, forcing them to abandon their camp. Ransom’s Brigade moved swiftly toward Battery No. 9 to the north, the 56th North Carolina forming the extreme left of the Confederate forces. The regiments of Lewis’s Brigade, led by Hamilton Jones of the 57th North Carolina, pushed northeast toward FortFriend (formerly Confederate Battery 8) located 1,200 yards in the rear. Below FortStedman, Colonel Waggaman emerged on the right of the fort with only about half of his Louisiana Tigers contingent intact. They moved slowly to the south. They may have been among the troops plundering the baggage of the Federals who had abandoned Battery No. 11. For a time, the 100th Pennsylvania under Lieutenant Colonel Joseph H. Pentecost stoutly resisted Confederate skirmishers advancing on the works to the south and toward Meade’s Station in the rear. The 29th and 59th Massachusetts Veteran Volunteers rallied briefly to retake Battery No. 11.
the success had exceeded my most sanguine expectations. We had taken FortStedman and a long line of breastworks on either side. We had captured nine heavy cannon, eleven mortars, nearly 1,000 prisoners, including General McLaughlen, with the loss of less than half a dozen men. . . . I was in the fort myself, and relieved General McLaughlen by assuming command of FortStedman. Gordon had indeed breached the Federals’ front line. Now he awaited word from the three detachments advancing on the second line of Federal forts. Walker, “Gordon’s Assault on FortStedman,” 25. According to Captain Joseph P. Carson, this “graphic account . . . was given by him to a reporter of the press several years after the close of the war,” quoted in Henry W. Thomas, History of Doles Cooke Brigade: Army of Northern Virginia, 1861-1865 (Atlanta, 1903), 35. J. D. Barrier, “Breaking Grant’s Line,” in Confederate Veteran, 43 vols. (Wilmington, 1986-1988), vol. 33, 417; Richmond Times Dispatch, March 28, 1865, 1. OR 46, pt. 1, 322-325. Hodgkins, Battle of FortStedman, 24; OR 46, pt. 1, 341; George L. Kilmer, “Assault and Repulse at FortStedman,” Century Magazine (September, 1987), vol. 34, No. 5, 783-791. A virtually identical version of Kilmer’s account is found in Johnson and Buell, Battles and Leaders of the Civil War, vol. 4, 579. Colonel Thomas W. Clarke, adjutant-general of the Third Brigade, vehemently denied the accusation that the men in FortStedman had been drinking or gambling. Clarke also stated that, “Standing orders required the troops to be under arms half an hour before daybreak.” Anderson, The Fifty-Seventh Regiment, 268; Hodgkins, Battle of FortStedman, 24. Barrier, “Breaking Grant’s Line,” 417. Thomas R. Roulhac, “Forty-Ninth Regiment,” in Clark, North Carolina Regiments,vol. 3, 144, and Robert D. Graham, “Fifty-Sixth Regiment,” 390. Laura Virginia Hale and Stanley S. Phillips, History of the Forty-Ninth Virginia Regiment: “Extra Billy Smith’s Boys” (Lanham, 1981), 203. Bartlett, Military Record of Louisiana, 40. I. G. Bradwell, “Holding the Line at Petersburg,” Confederate Veteran, vol. 28, 457. Michael J. Andrus, The Brooke, Fauquier, Loudoun, and Alexandria Artillery (Lynchburg, 1990), 85. Bartlett, Military Record of Louisiana Troops, 40; OR 46, pt. 1, 331. Robert Grier Stephens, ed., Intrepid Warrior, Clement Anselm Evans: Confederate General from Georgia; Life, Letters, and Diaries of the War Years (Dayton, 1992), 535. Gordon, Reminiscences, 411. H. A. London, ed., “Battle of Fort Stedman,” The Chatham Record,March 27, 1912 (page not indicated). “Mr. Edward Crapsey’s Letter,” Philadelphia Inquirer, March 28, 1865, 1. Hi-My gg grandfather was in the 43rd AL INF, Gracies Brigade & was captured 3/25/1865. His name was JWF Lowry (Misspelled in records as Lowry, not Lowrey) He was a corporal when captured. I think YM Moody then commanded the 43rd. It was not Ft. Steadman, but I believe Watkins Farm, further west near a part of Hatchers Run, just before 5 Forks. About a year or more ago, I asked if you could help and you emailed some wonderful info that I have since misplaced. It had some info from Richmond paper on that engagement for example. I can’t seem to find that level of detail–any chance you might be able to do so again? He was my great grandfather. His wife and family traveled on to Mansfield Louisiana after his death. I have some information on him including a copy of a letter he wrote while entrenched in St. Petersburg. I guess I can call you cousin.